We are excited to announce just a few of our live courses that will be beginning in early 2016... some as early as the next few weeks! Scroll to learn more about each course, along with details about starting times and instructors. In 2015, we completely re-engineered our recording studio with top of the line gear, including a full suite of 4k cameras complimented by a new audio outfit. The result is beautiful live streams to your computer, in qualities as high as 1080p! Develop YOUR foundation for playing the Blues! Learn the basics, and then see how extremely simple ideas from classic Blues players have influenced modern, more contemporary players. Get some ideas from such Blues greats as Stevie, Jimmy, Jimi, Buddy, Muddy, Chuck & more! It is not about how many notes you can play. Notes were expensive in early Blues and the players worked with a little to create a lot! Keep this in mind as you take this course. We won't be shredding or using stopwatches. We will be looking at HOW to play notes and grooves so that they have ATTITUDE and CHARACTER. See you there! 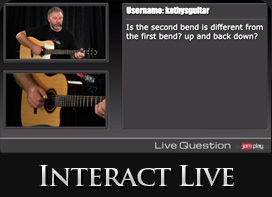 Playing the guitar and understanding the guitar are not one in the same! Building muscle memory and practicing rote memorization can take you a long way on the instrument, but to make your music come alive, to truly develop your own unique music personality, you must understand the instrument. That's what this course is all about, taking the most useful bits of music theory, teaching them in an easy to understand, sequential manner and then applying this information directly to the guitar. Having this knowledge will improve every facet of your playing from learning songs, to improvising, to writing your own material. Your friends, family and fellow musicians won't believe the change that can be wrought in a mere 8 weeks. Whether you just purchased your guitar, or are revisiting your old friend after many years apart, this course will get you up to speed quickly. 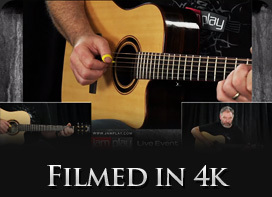 In an easy-to-follow live 10 week course, Chris Liepe of JamPlay teaches you all the basics necessary to master the instrument. And more importantly, everything you learn will be applied to fun downloadable backing tracks which make learning fun. He will cover the basics of chords, playing rhythm playing with backing tracks, understanding tablature and chord charts, and of course get you started on playing with tracks. This course is all about learning to bring out your inner melody in the easiest way possible. Forget learning years of theory or memorizing hundreds of patterns. This course focuses on the nuts and bolts that can take even the most mundane of playing and inject it with a healthy dose of of soul. Every beginner or intermediate player will find something here to take their playing to the next level. 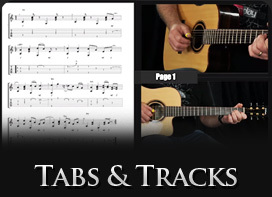 Each week will come with at least one backing track. This track will be used throughout the session to illustrate all the examples and concepts discussed. Intro to Playing Melody and taking Lead Guitar "Breaks"
Every well rounded player has a solid rhythmic foundation. Are you ready to join their ranks? This course will make it easy. Each week will shine our mental spotlight on one particular facet of rhythm playing, and explore it with useful (and fun) exercises. By the end of the 10th week you will be proficient in 10 new facets of rhythm playing, and be able to hold your own in any musical situation.